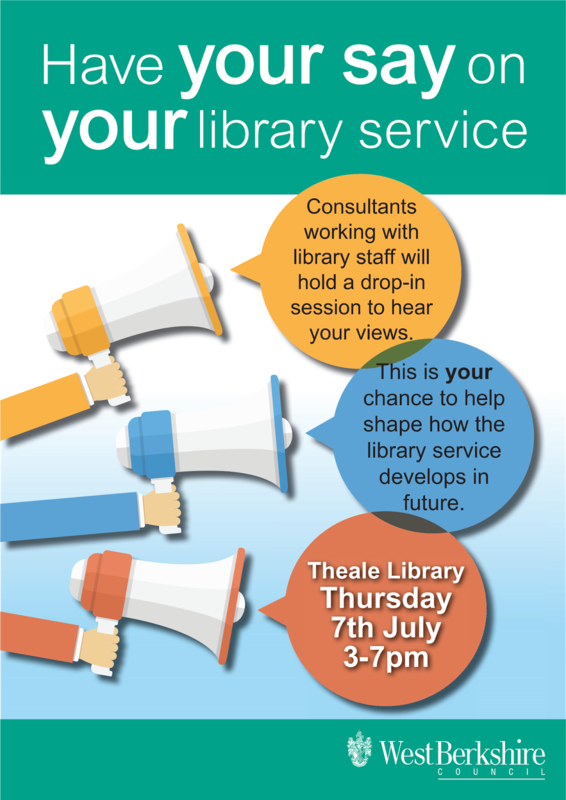 Your chance to tell West Berkshire Council's consultant how much you value Theale Library. 3pm to 7pm 7th July. This is part of the Councils Needs Assessment. Please see http://info.westberks.gov.uk/index.aspx?articleid=30287 for days and times of these activities. Please keep using the library - we need to show West Berkshire Council that we use and value it! West Berkshire Council has given an assurance that no libraries will close until a needs assessment has been completed. This has just started and is due to be completed by the end of August. Therefore all the libraries, Theale included, will stay open until at least the autumn. Library visits during open hours. A half day will be spent at each library so that users, “friends” groups, parish councillors, etc., can speak to the consultant. These visits will be publicised in advance. The consultants are scheduled to report back by the end of August. A summary report will be published. West Berkshire Council’s Executive will then make a decision on the future of the libraries. 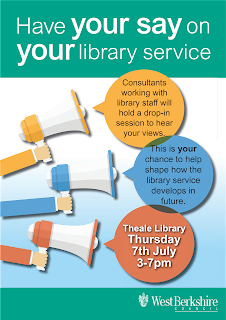 Please keep using the library to show the consultants and the Council that we use and value it! A planning application has been submitted for 225 homes on the Burghfield Sailing Club site, just the other side of Theale Swing Bridge. 25 of those will be “can float” homes on the edge of the lake that will rise if the water level in the lake rises as a result of flooding. Although the site is in Burghfield parish, the development would probably affect Theale more than Burghfield. The application number is 16/01240/OUTMAJ. The original planning application to turn the Red Lion into a house plus eight flats was refused planning permission and the developer’s appeal against refusal was dismissed. However, dismissal was only on the grounds that no affordable housing was being provided. The planning inspector did not accept the Council’s other reasons for refusal (detrimental effect on neighbouring properties and lack of parking spaces). The application to turn the pub into a house and build seven flats was approved at last week’s planning committee, provided the applicant signs an agreement to provide at least £50,000 towards off-site affordable housing. This sum to be increased if the sale proceeds from the house and flats exceeds the amount estimated in the applicant’s viability study. In the meantime, the applicant has submitted another application to convert the pub into a house and build eight flats. This is application number 16/00853/FULD. The Red Lion has been registered as an “Asset of Community Value” and the “Save the Red Lion” group has until 12th August to make an offer for the pub. The IKEA Calcot store is scheduled to open on 14th July. They withdrew their planning application for a 42-metre “navigation tower” and their application for a “parapet sign” – a large internally lit “IKEA” letters on top of the store and facing Theale – was refused by West Berks Council. They were given planning permission for other signs and flags at last week’s planning committee meeting. Unfortunately, Lloyds Bank decided to go ahead with the closure of their Theale branch. This is despite the petition containing 587 signatures that I presented to them. The branch closed on 8th June. Another cash machine has been installed in the One Stop shop in Theale High Street. It is free to use and is sited at the back right-hand corner of the store. This means that there are two cash machines in Theale following the Lloyds closure, the other one is in the Co-op. Theale Parish Council have agreed to release the land on the North Street Playing Field for the new primary school, subject to conditions. The conditions are contained in this letter to West Berks Council’s Chief Executive. Satisfying some of the conditions may not be straight-forward and a suitable piece of compensatory land has not yet been identified.